When the forecast calls for hats, gloves, and scarves, it’s time to break out the Nordic Grips. 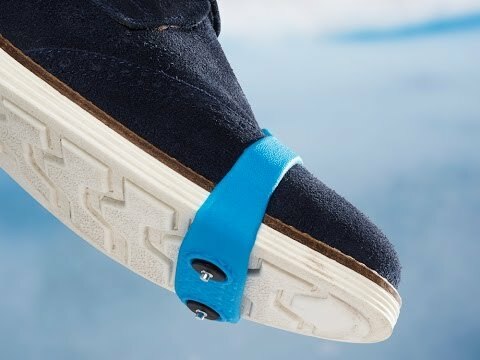 All the way from Norway comes a smart little problem solver for icy conditions. Designed to fit right over your favorite pair of shoes, Nordic Grips help prevent you from slipping without compromising your style. 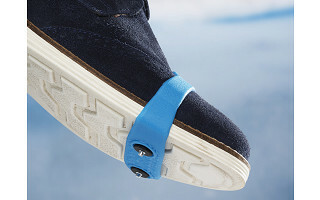 Available in a variety of colors, Nordic Grips are an easy, affordable, fashion-friendly way to add security to every step. 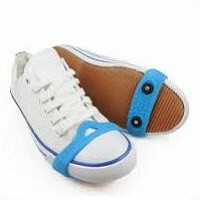 Each pair even comes in a convenient carrying case compact enough to tuck in your pocket or purse when not in use. No bulk. No worries. No wonder people of all ages are stepping out in Nordic Grips. Hi Grommetland - I am the CEO of Nordic Innovation – we are the North American distributor for Unikia and also owned by them. We're on a mission to introduce great products that help keep you safe as well as other innovative ideas that quite simply will make your life easier and make you smile. Our first highly successful brand is Nordic Grip, and the Mini is a popular item around the world. I have used them in the streets of Oslo and in northern Wisconsin where I live. Please ask me about Nordic Grips. They are designed so you can out run Polar Bears! I was just going to ask if you would need 2 pair. Do you have any that aren't mini? Despite the name, they aren't actually "mini". In the "details" section, you'll see all the sizing options and info. I dog walk here in AK everyday and wonder if this will fit over my winter boots. The mini ones do not look like they will. Scan just above, someone asked the same question. @Amy when I click on the color, then click on the size -only small is available. are the large OOS? or not available? @AMY looks like your website is not working quite right. I have been trying to enter a comment and when I click on "order now" or 'reply to conversation" it take me directly to my order history. @Amy, looks like pick is the only color that has large and small. @Jocelyn Alas we sold out of the other colors. I am sorry about that and about the other site issues you were experiencing. That happens to me sometimes and we cannot find the bug...it is so rare it makes it difficult to identify and squash. Sorry to be the bearer of bad news here Jocelyn. Hi! Looks like something I'd like to purchase, but when I clicked on the "Choose An Option" button for size it doesn't come up with any size options although they are listed in the product features. Help please. I'd like to purchase several. You need to choose the color first in that drop-down and then the options will show up for sizes. Try that and let us know if that does the trick. Hi, they look well made. I have 2 questions: How long do these last, particularly the studs if walking on sidewalks. Also, I have a men's size 8 shoe, will the large Grips be tight enough to go hiking in the mountains without shifting on my boots and having to re-adjust (like a different brand of grippers did). These are great questions. I have contacted David so he can answer properly for you. He should be along shortly. I contacted the founder and for your first question, he says that you will not wear them out unless you are wearing them outside all day for days on end. You should be good for a long time! I wear a men's size 15. Do any of these fit that size of shoe? Thanks. Our large should fit up to size 13 for men so you may have just missed the cutoff. I see no information on sizing. How is this determined. I need one pair to fit a woman's athletic she size 9.5 and another for a man size 11.5. I only see the color pink....not what a man would want! @felicity Click through on the orange Buy button and you will see sizing info. But I can also save you the step and tell you that both people will be fine with a Large. Alas, pink is the only color left--which few guys would want to wear for this purpose. Alas, this Grommet flew out the door and we have to get a new shipment in from Norway. I know that is disappointing news if you want it on time for Christmas. This the perfect holiday gift for my father. When will these be back in stock? These certainly were a popular item and we hope to get them back in stock soon. Unfortunately, it doesn't look like we will have them in time for the holidays, but they should be available within the next week or so. Your father will still have plenty of time to use them for the Winer season!